When it comes to creating a seal, most federal agencies keep it simple: show what you do. The Forest Service: A pine tree. The Bureau of Reclamation: A lake. The Federal Communications Commission: Telephone lines. It’s usually not complicated. But for the NRC, the eagle-centered seal reflected the controversies that caused its creation out of the former Atomic Energy Commission (AEC). Even before the NRC opened its doors on January 19, 1975, the U.S. Army Institute of Heraldry produced a number of seal options for the agency. 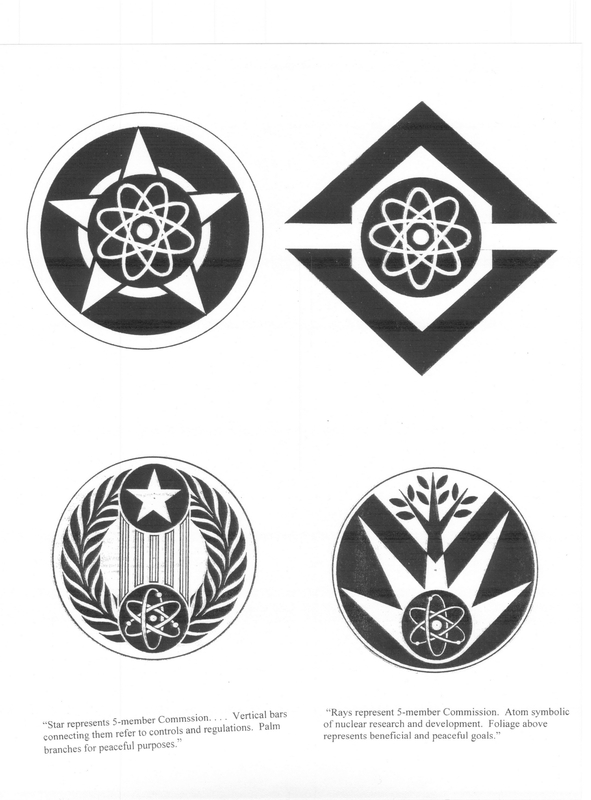 The Institute’s key symbols were the atom to represent nuclear R&D and five pointed stars or similar figures to represent the five Commissioners, and usually had a circle to “symbolize complete control for peaceful purposes.” AEC counsel Marcus Rowden, soon to be one the NRC’s first five commissioners, was “somewhat underwhelmed” by the choices and suggested soliciting employee submissions. In early 1975, employees, family members, and contractors submitted about 70 designs. While some employees simply wanted the old AEC seal superimposed with the new agency name, others were unconventional, including one attempt at Leonardo da Vinci’s The Vitruvian Man. 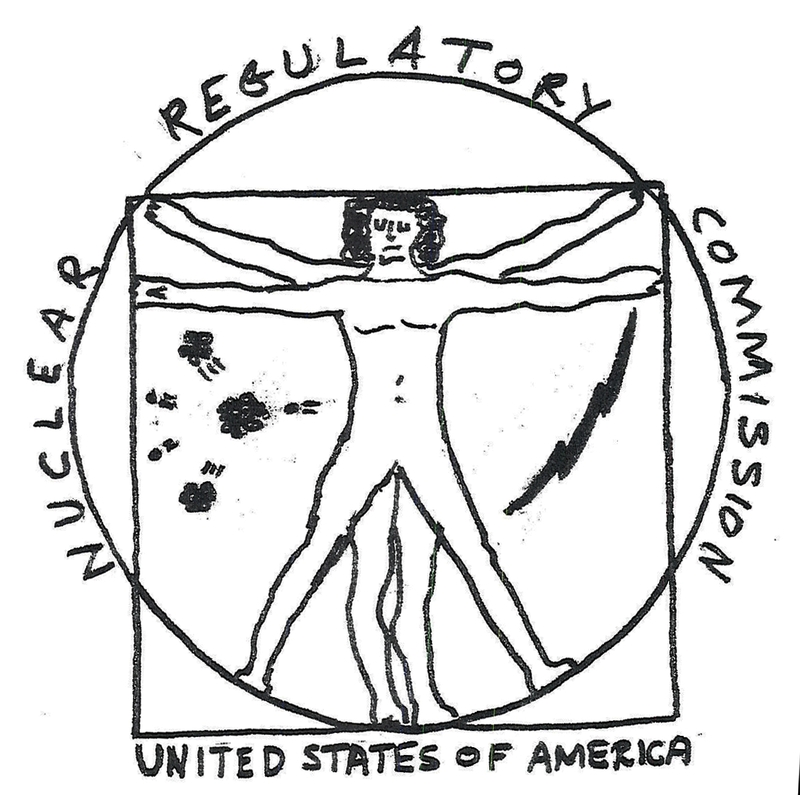 Many reveal what the first NRC employees imagined their agency should be by using symbols depicting a broad agency mission of public safety, environmental protection, and fairness in the regulatory process. A selection committee picked a number of finalists and sent them to the Commission. But none of the finalists got the nod. The NRC was created in part because of the perception that the AEC favored promoting nuclear power over ensuring its safety. The AEC’s seal had prominently displayed an atom at its center. Any submission that reminded the public too much of the NRC’s link to the AEC was a non-starter. 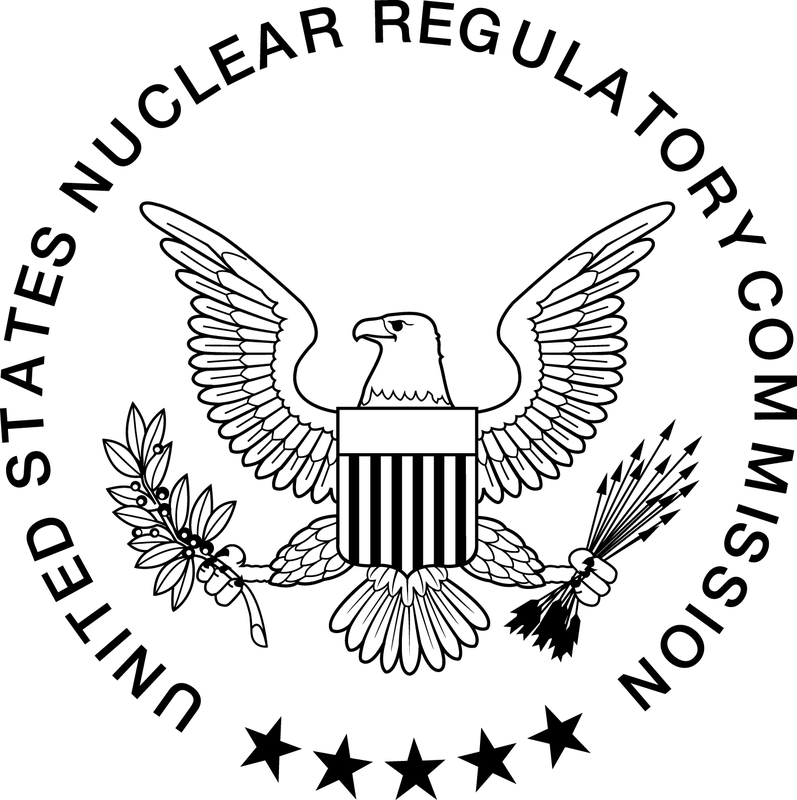 Additionally, some NRC retirees recall that federal agencies questioned whether the NRC, a regulatory agency with considerable independence, could represent the federal government on export licensing issues. It seems that the agency needed a seal that broke with its past but clearly linked it to the federal government. The Commission opted for a bald eagle featured on the seals of the President and several agencies. Benjamin Huberman, the director of the Office of Policy Evaluation, put his engineering drafting skills to work. He pulled a dollar bill out of his wallet and used its eagle as a model. He eliminated the dollar’s cluster of 13 stars, as well as the ribbon clutched in its beak. He added the NRC’s name and five stars to represent the agency’s five Commissioners. It was approved. The NRC’s selection of a seal reflects a regulatory agency seeking to distance itself from a promotional past while also clarifying its new place firmly within the federal government. I think the seal that was chosen is an excellent choice as were the thought behind its selection.